Opportunity to Grab Huge Discounts & Valuable Freebies! It gives us immense pleasure to inform you that we are celebrating this festive season by giving maximum discounts and freebies to our members with Saral Gyan Dussehra Diwali Offer of the Year, this is a limited period offer and closes on 02 Nov'16. 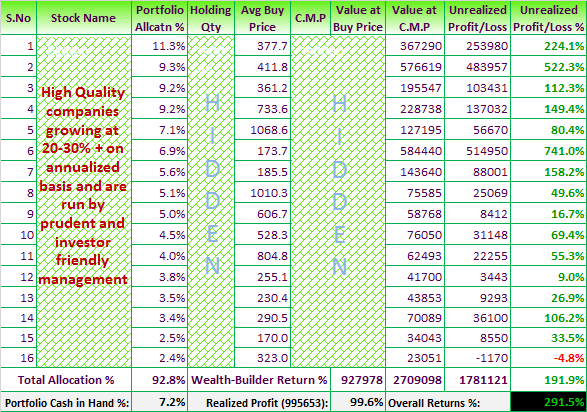 Total 52 Hidden Gems (Unexplored Multibagger Small Cap Stocks) released till 31st Dec'15 continue to shine giving as on date average returns of whopping 299% to our Hidden Gems subscribers compared to 63% returns of small cap index during last 6 years. Hurry! Offer will disappear on 2nd Nov'16 at 11.59 pm. Click here for details.